One of the reasons I would never leave DomainShane.com to write for another blog that perhaps may be offering more money is because on most any other blog I wouldn’t be able to do a post like this. Sure this is a domaining blog, but domaining is a business, and inspiration or business can come from anywhere. I think one of the main reasons I enjoyed this blog so much before I started writing here, and why many of you enjoy it now, is it’s not ALL about domains. You can expect to be entertained here and can expect to see stuff on this blog that you probably wouldn’t see on other domaining blogs. I’d like to congratulate my step-brother, Brian Feirstein, who is currently opening his first restaurant. He’s no stranger to restaurants, as he’s been the executive chef at two of the most highly regarded restaurants in the Phoenix area for years, but it’s always been his goal to start his own and his dream is finally coming to fruition. Cask 63 is the culmination of dedication, determination, and most of all just good old-fashioned hard work. Brian’s taken no short cuts in achieving his goals. He spent years in culinary school, years on the front lines, and years as an executive chef creating amazing food that made other people money. Not anymore, now it’s his turn to reap the benefits of all the hard work he’s put in over the years. Many will be quick to point out that most restaurants will fail. What many don’t realize is that most restaurants who fail were ran by people who didn’t have a clue what they were doing . That’s not the case here. This restaurant will succeed and will do so because they made a business decision that we can all learn from…. Surround yourself with people who know what the hell they’re doing. Every aspect of this restaurant is run by an expert in their field; the kitchen, the bar, the wine, the general management. One person can’t do it all, two people can’t even do it all…it takes a team of individuals with years of experience in their field and area of expertise to make it work. The same goes for domaining or any business you’re starting. While it’s easy to get into domaining, its difficult to succeed. Domaining is primarily a solo sport, doing it yourself most of the time. But if you take the time to branch out and meet others in the industry who have had success, you’ll a lot better off. Just having someone to bounce ideas off of will do you wonders of good. I can’t tell you how many times I’ve thought I had a good name lined up until I ran it by Shane and he gave me his opinion on it. Just getting someone else’s view-point can save you a ton of money. But it goes both ways…there are times I’m on the fence about a name…I’ll run it by Shane and he’ll say “that is a great domain”…I know I’m on the right track then. By surrounding myself with others who have knowledge in different areas, it increases my chances of success. 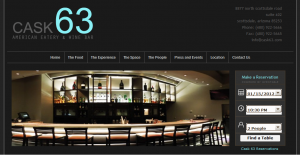 If you are in the Phoenix, go ahead and check out Cask 63. If you’re wondering, I did his web design. While I realize I’m not the best, i don’t think I’m the worst. There are still a few site kinks to work out but it’s coming along. Anyways, its a bit pricey, but the food is absolutely amazing, you won’t regret it. I had the crab cakes and wild mushroom flatbread on Friday night, just terrific. And whether you’re starting a new business or domaining, do yourself a favor and surround yourself with folks who know what they’re doing. It will go a long way in helping you succeed. Great site, Chris. Are you going to Domainfest? Unfortunately I will not. I’ve been job searching for the last few months and just couldn’t commit to something I wasnt sure I’d be able to attend. I will however be sending my representative, Shane Cultra. I think the site looks great. Nice job. The site looks good. One thing I usually like to do is disable the WordPress and theme links in the footers on sites I make. I hear ya. I plan on doing this. I am just extremely lazy so it takes me a while. Not only does the site look great but the restaurant looks outstanding. No wonder it’s pricey. The cost is justified by the atmosphere and dining experience. You already said the food is great. No truer words have been spoken – I learnt the hard way with my own web-hosting reselling business at 16.